Posted on 29. Jun, 2010 by Corey in All, Dayton Dragons Baseball, General Baseball. 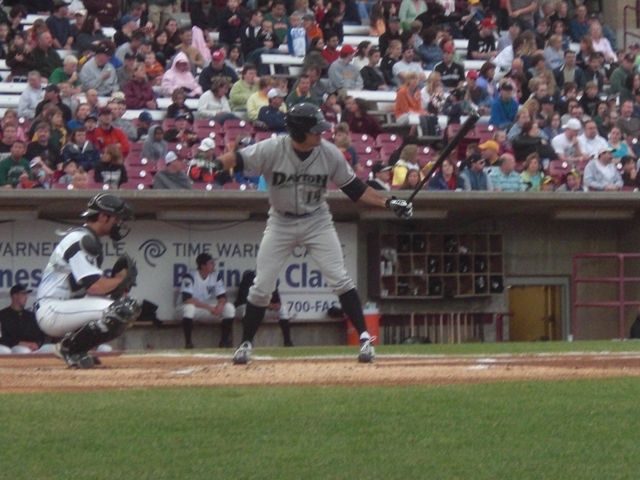 Ryan LaMarre had just been drafted in the second round by the Cincinnati Reds in June. He wanted to sign as soon as he could and was anxious to get his pro career started, at whatever level the Reds asked him to play at. The plan was for LaMarre, a Michigan native, to drive down to Cincinnati and attend a Reds game at Great American Ballpark. There, he would sign his contract and begin to soak in the feelings of being a Red. LaMarre was told he would then report to Goodyear, AZ for Reds Mini-Camp at their Spring Training Complex before most likely being assigned to the Rookie Ball team in Billings, Montana. With one phone call around midnight, the entire plan changed. The voice on the other line told LaMarre that a center fielder was needed right away in Dayton and asked if he was ready to sign and play that weekend. Eager to get going, LaMarre said yes and his journey began. The next morning LaMarre awoke early and left his house in Michigan to drive to Dayton. There, he went through his physical and signed his contract to officially become a member of the Cincinnati Reds organization. He stopped by Fifth Third Field to drop off his car, and pick up his number 14 game jersey. LaMarre was given a ride to the airport and boarded a plane to meet the team in Appleton, Wisconsin where the Dragons were taking on the Wisconsin Timber Rattlers. Following a slight delay, LaMarre arrived in Appleton and came straight to the team hotel. The Dragons had been rained out that night, meaning most players were scattered around the hotel grabbing something to eat. LaMarre did not meet most of his teammates until boarding the bus the next day for the team’s doubleheader. After sitting and watching game one of the double dip, LaMarre was inserted into game two. It was the first time he saw live pitching in weeks, but LaMarre had a few good at bats as he got accustomed to life in professional baseball. oye que bueno juega ese chico me parece que muy joven para tener tanto potencial, lo vi jugando en venezuela y me parecio buenicimo. henry rodriguez .sigue asi vas a llegar muy lejo.